I'll admit it, I never played any Zelda game in my life! As kids, my brothers and I were not allowed videos games so we never had access to them. If there was any game that I would play however, it would have been a Legend of Zelda game. I ended up cosplaying as Sheik to team up with a friend who commissioned a Princess Zelda costume from me. I was very afraid of tackling this costume as there are a ton of layers and it was quite difficult to pick out the details and colours. I chose to cosplay a version which was described as "twilight princess concept art." It is very similar in design to the Super Smash Bros character but with darker colours. Shirt - In order to make the shirt, I took my Green Pepper "Crystal Lake" Skating Pattern with sleeves and modified the leotard into a shirt. 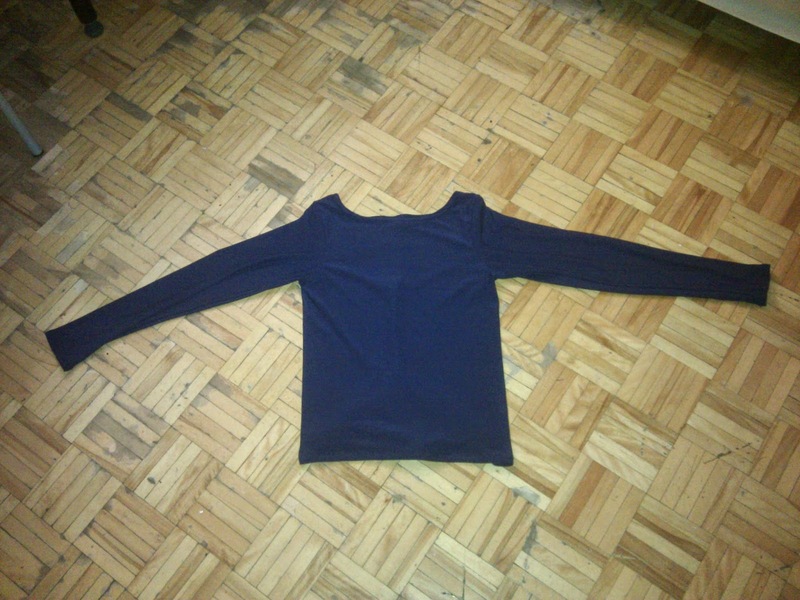 I used a navy blue knit fabric that offered a decent amount of stretch in both directions. Harness - The harness has an interesting design to it. I had to draft my own pattern for it using the old saran wrap and packing tape method. 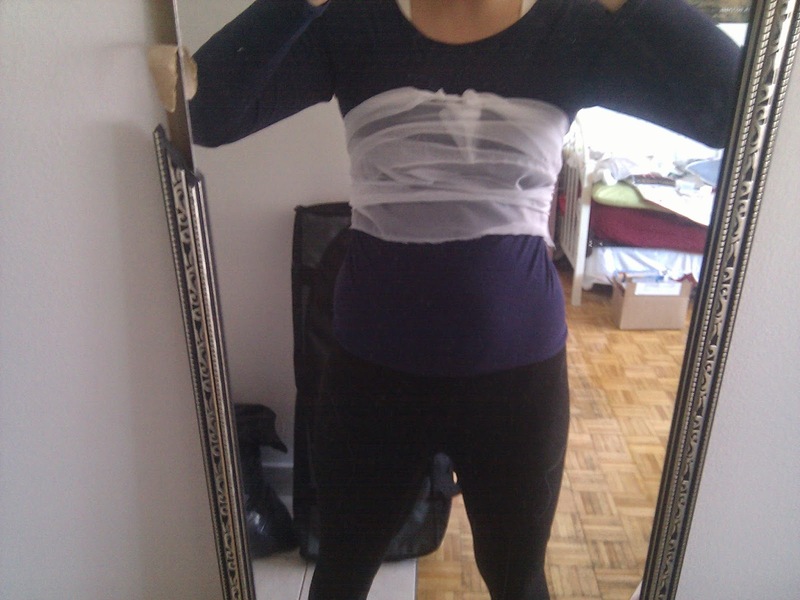 It's always difficult to wrap yourself and draw on yourself even when you have a long mirror to help you out. 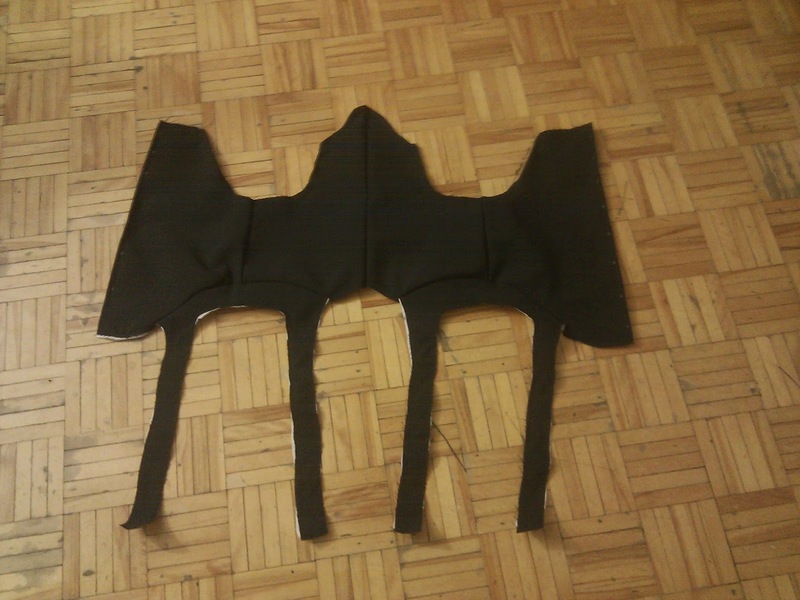 Luckily, the harness is symmetrical and so I only needed to get one side of my pattern right. Once I was cut out of the pattern, I traced it on newspaper and added my seam allowance. 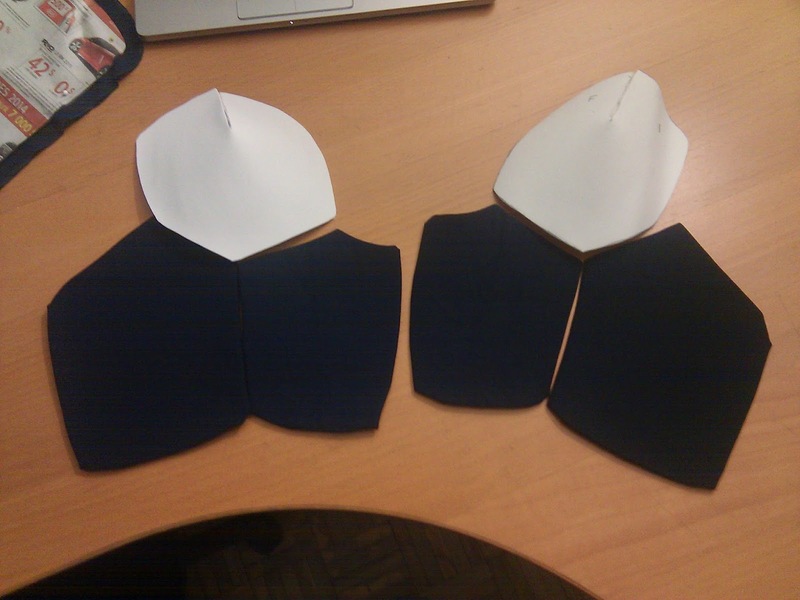 I cut out the pieces from a black, medium weight material as well as a medium stiff interfacing. 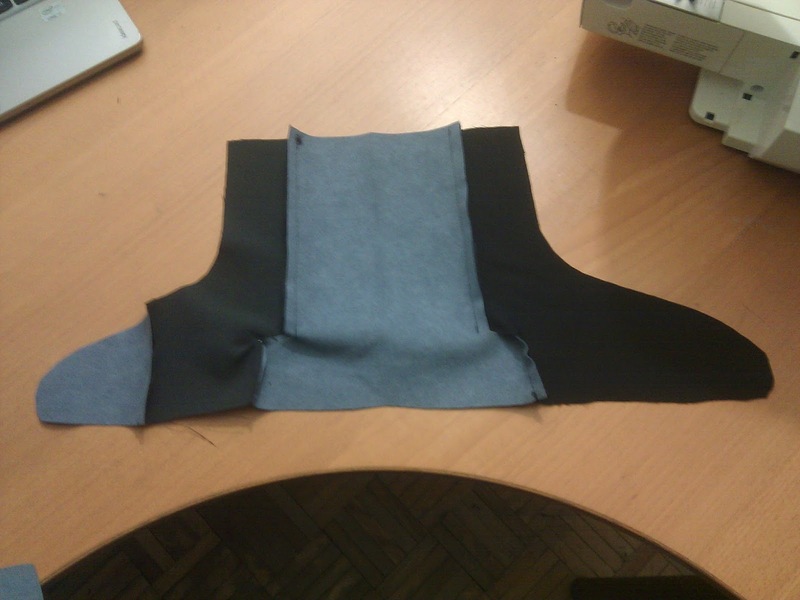 I sewed the interfacing to the matching black pieces before sewing everything together. I designed the harness to have a halter top to keep it from sliding down my body as well as a functional lace up front. 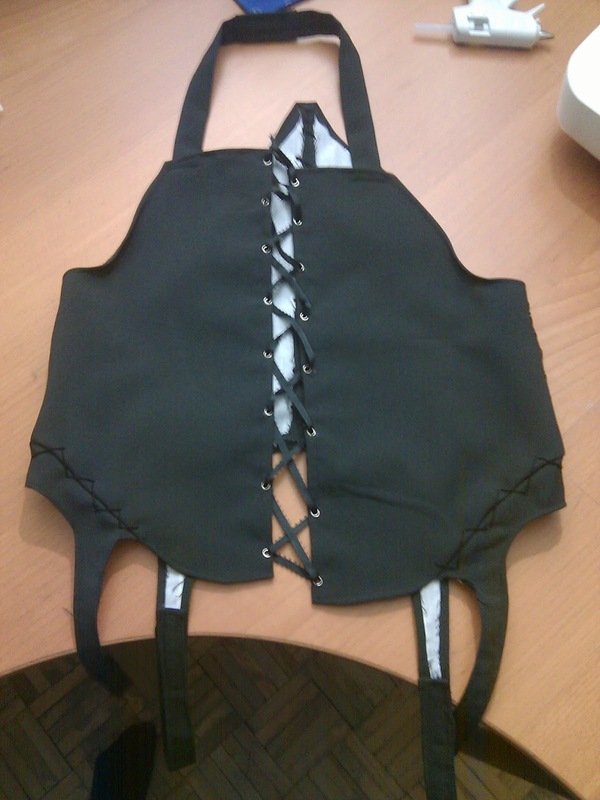 The back of the harness attaches to the tabard with pins. The harness has decorative stitches along the seam lines to give the illusions that they are holding the garment in place. 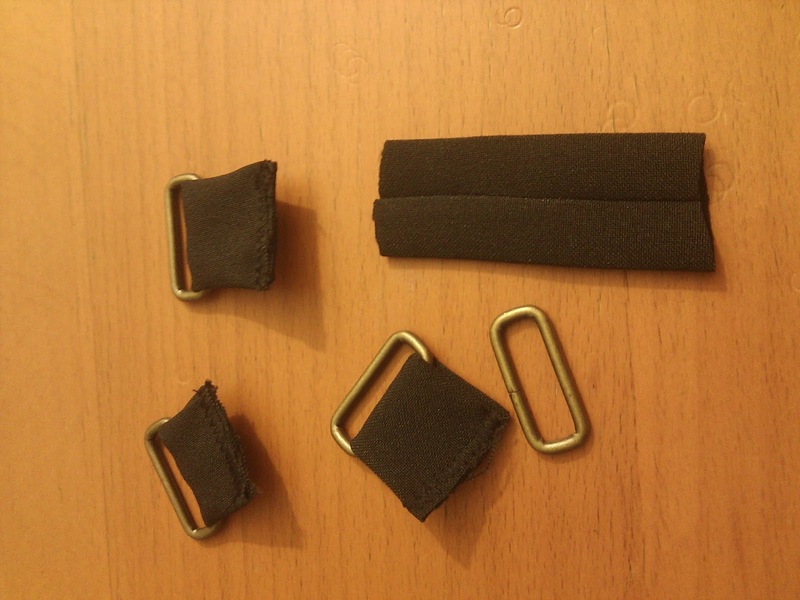 It also has two long straps on each leg with velcro fasteners to facilitate the support of the thigh armour. Armour - The armour was pretty difficult to figure out due to the colours in the image kind of melding together and the armour having strange shapes. I ended up going with a soft armour look using craftfoam covered in fabric. The calf armour was easily drafted by saran and tape wrapping my leg and cutting out the pattern. The thigh armour was sketched out first, then with some careful measurements I hand drafted a pattern on newspaper, making it larger than required. I then wrapped the pattern around my thigh and made adjustments to the pattern until I liked it. The armour for the arms was drafted using the saran and tape method once again (I swear by this method for pattern drafting). The forearm pattern that was produced was altered to have a part that extended over the back of the hand while the shoulder armour was darted to make the rounded shape. Once all the patterns were created, they were traced onto the craftfoam and cut out. The patterns were transferred to the fabric with extra allowance along each edge. The fabric was then glued to the craftfoam with hot glue. The extra fabric was turned to the back and glued in sections. Along curved edged the fabric was clipped or folded over to create a smooth curved edge. The thigh armour had white bias tape glued along the edge while the arm armour had the white detailing painted on. 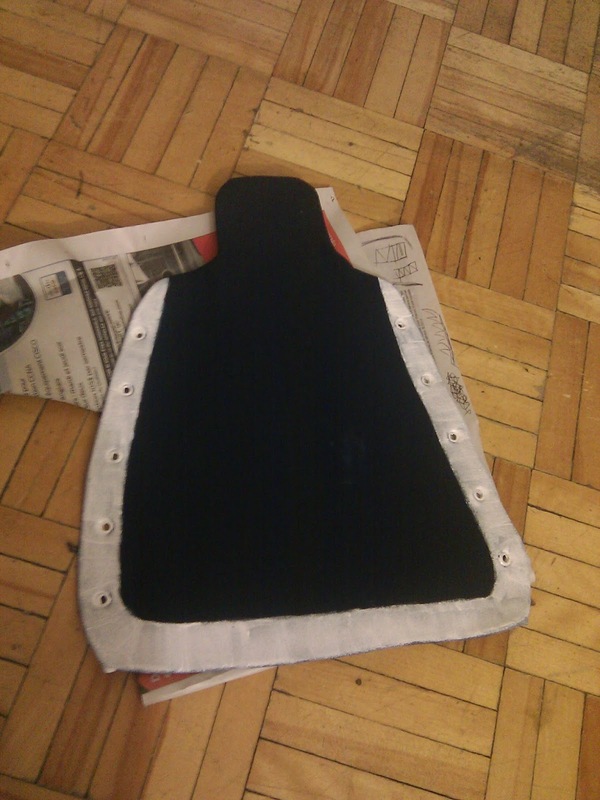 Once all the fabric was glued onto the foam, the eyelet holes had to be punched. Some armour pieces had to be punched using a hammer and a eyelet puncher on my floor (which caused holes to appear in the wood tiles all over the place) while some holes could be punched using my leather punching tool. All the eyelets had to be hammered in place which caused dents in my floor. Note to self, must get a small piece of plywood for hammering eyelets ;) The lacing that was used for each shoulder piece was embroidery thread, while all the functional lacing was black cord. In addition, the thigh armour was modified with D-rings to attach to the harness while the shoulder armour was equipped with velcro to attach and be supported by the shirt. After wearing the armour for a while I noticed that the craftfoam ripped along one of the D-ring attachments and that the velcro occasional would come off if the shoulder armour was removed from the shirt. Some adjustments will be made to the thigh armour to try and prevent further damage and shoulder armour will only be removed when the short requires a wash.
Craftfoam armour does not breathe so as one can assume, it can start to smell after a period of wearing it. I use a fabric refresher on the armour to try and alleviate the smell. I also let it dry out on my floor. The under garments require washing after every use, even if it was only worn for an hour or two! Therefore this is a costume that I would only wear once every con. Bandages - The bandaged were made by taking a light weight curtain material and ripping it across the grain. 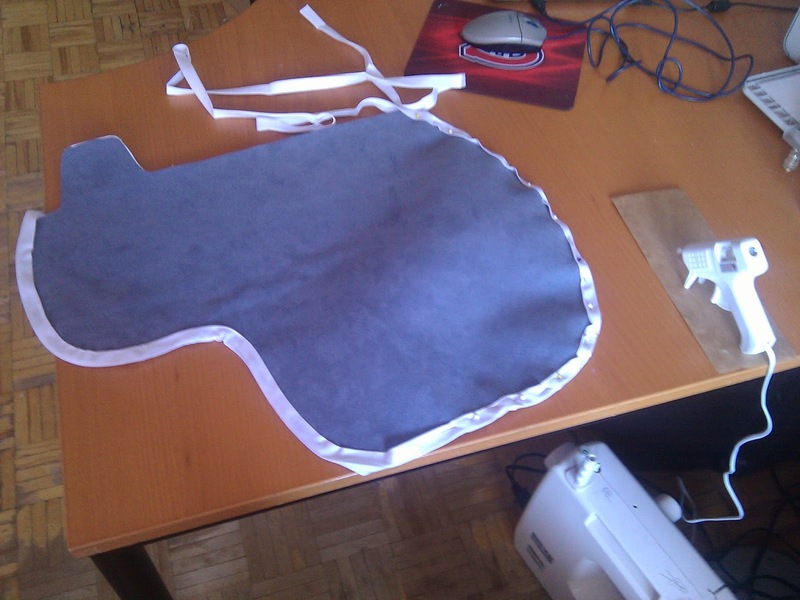 The fabric tears very nicely and doesn't fray easily so there is not need for fray check. The forearm bandaged just required one length of the fabric while the thigh armour required two lengths sewn together and the chest bandages required three lengths sewn together. The fingers would be taped using surgical tape. Tabard - The tabard was hand drafted on a piece of canvas. The edges along the bottom and the shoulders were clipped to try and give it the ragged look while the design on the front was hand drawn in pencil, primed with gesso and carefully painted with acrylics. Scarf - The scarf was made by taking a wide length of a white knit fabric that draped nicely. The two ends were sewn together to create an infinity scarf. The scarf is looped around the neck twice. The face covering part of the scarf is a seperate piece that ties behind the neck to cover the mouth and nose. Shoes - The shoes are actually slippers with a shoe cover sewn over them. I chose a light blue coloured slipper from Walmart as my base and drafted the shoe cover by measuring my foot and drawing out the pattern. The pattern had a interesting design which required multiple parts to be sewn together. I used a seam allowance of 1.5 cm which normally works out but this time it was a little too tight. Next time I will use a seam allowance of 2 cm. Some of the pieces had to be sewn by hand as the machine couldn't get into the really right corners. The entire shoe cover was then sewn onto the slipper. The cover extended up the ankle and laces up in front. Wig - I used a long, blonde wig I got from cosplay.com as the wig. As Sheik has a very strange braid, I tried to mimic it by inventing the weave which then turned into a normal braid. The hair "bandage" as I call it was a long piece of ribbon, wrapped along the end and sewn in place. The end piece was made using craftfoam and it was glued in place. After a few times wearing the costume the braid came updone due to rubbing. The ribbon wasn;t completely sewn to the wig which also caused some problems. 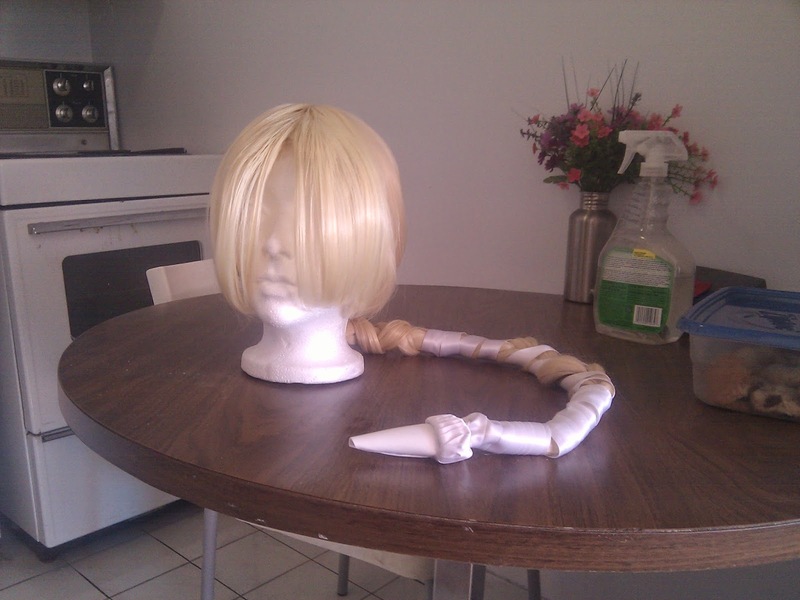 The next iteration of the braid will involve the ribbon being glued to the wig in hopes of it staying in place. Hat - The hat is composed of two parts, the first part being the base which is a simple cap sewn from a white knit fabric with some ripped bandages sewn along the top. The second part is composed of two lengths of the ripped bandage fabric sewn together. It is wrapped around the head at the base of the cap and pinned in place using bobby pins and straight pins. Using Worbla which is heat activated over a Styrofoam base isn't the best idea in the world... but it works! Obis are hard to tie with super long sleeves! This costume seriously cost me less than $10! I was given most of the fabric and the only things I needed to buy were a few notions. 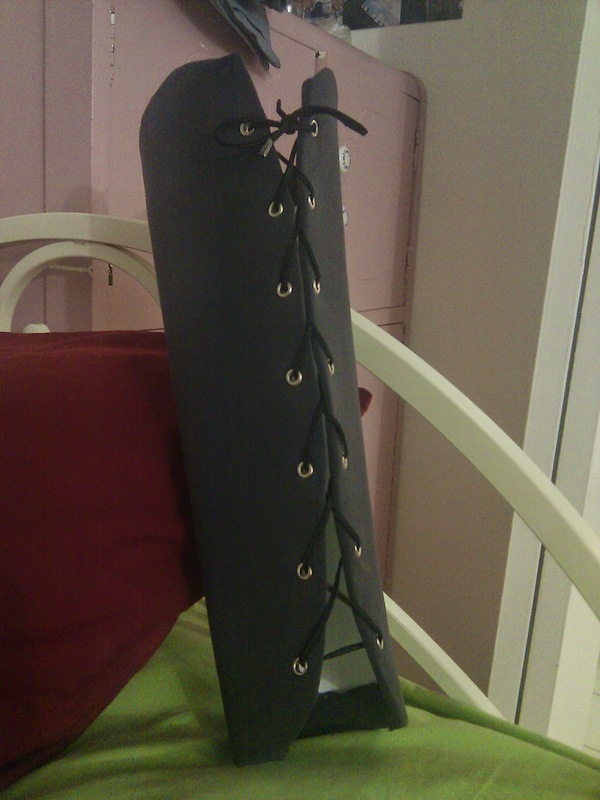 It was also completed in a day so it was the fastest cosplay to construct as well! Even though this costume is my most expensive one of the year, it still cost me less than $200, which I think is pretty good considering how much money one can spend making a costume! The prop I made for Sakura could have been made with cheaper materials but I wanted it to be durable and to last quite a few Sakura costume (as I plan to do many more in the future) so I opted for more expensive materials. This costume is still not 100% complete (still have some minor details to add and some repairs to do). 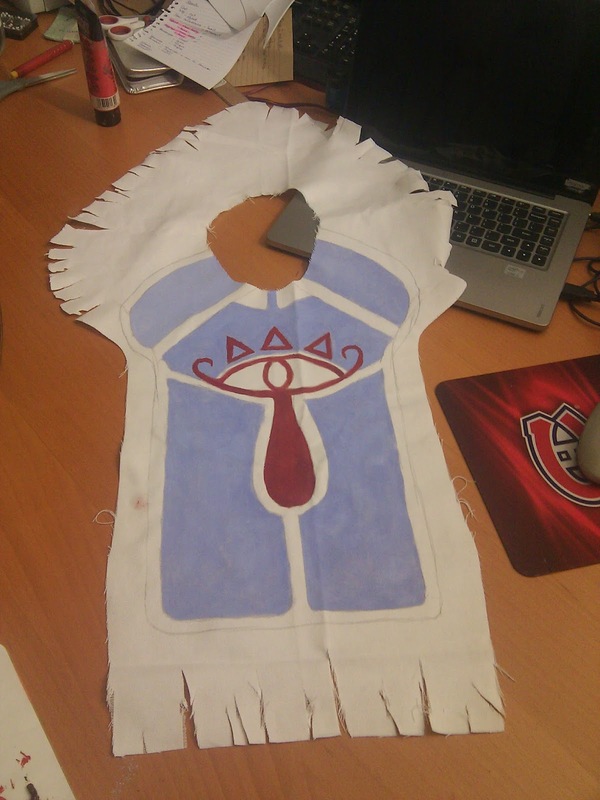 So far this costume has taken approximately 43 hours to complete (possibly more, I'm terrible at keeping track of time). The most time consuming part - adding all those eyelets to the armour! I finally achieved a childhood dream of mine! I love Sakura and I love her design, it was so awesome to finally walk around with a "real" clow staff and pretend to capture all the things! I have not yet been able to wear this costume to an event but I love it already! I've worn it around the house and I certainly feel like a princess in it! Hee hee this one is obvious after reading about my favourite cosplay! It was really fun to carry around my clow staff, even if it did make things more awkward. I went to a lot of amazing conventions this year but my favourite would have to be Otakuthon. I made so many new friends at this con and had a blast cosplaying magical girls all weekend! It was also the con that I happened to level up to the Journeyman category. I seem to improve with each performance I do, so it makes sense that I think my best one was the last one I did! I opted for a completely out of character walk on and it was hilarious! To see the performance, click here. As it turns out, my machine does not like the satin stitch. The appliques on the kimono took so long due to threads breaking, stitches not catching, machine needing oil then proceeding to stain my fabric and the Heat'n'Bond not adhering properly. I love meeting new people but I often feel that at a convention I don't get to mingle much with others unless I know them beforehand, The green room of the masquerade is different as it forces a bunch of cosplayers to remain in their dens for a couple of hours before the show. This allows you to meet new people and actually hang out with them for a bit! As it turns out, I am starting to develop closer friendships with the people that I met backstage.